School is officially out for summer!!! And man – is it ever summer. It’s the hottest June we have had in forever. And somehow this month flew by, like literally jumped from the first day to the last week of june in one day. My birthday was June 5, and it already feels like forever ago. In another week and a half it will be TWO MONTHS until we get married. TWO MONTHS!!!!!!!! where did the time go????? Holy moly let’s get going. We will be engaged for over a year and a half, and it seems like even that wasn’t long enough. There is SO much I want to get done this summer for the wedding, and being a teacher I am so lucky to have the next two months off to complete my big to-do list ( i know, the perks). Let the wedding planning countdown begin in full force. At the beginning of the month, we celebrated my birthday by going out of town for the night. It was on a friday this year, so we headed to the mountains for a getaway. We went up to Squamish for the night, and then climbed The Chief on the saturday afternoon. I felt like a horrible vancouverite for never having climbed it, and only completing ‘the grind’ (grouse mountain grind hike) for the first time the week before. It was fun to get out and do something outdoors for my birthday, seeing as how it has been absolutely gorgeous weather all month long. Of course, I had to make myself a birthday cake to bring up with us, that we no doubt had to burn-off the calories the next day on the hike. 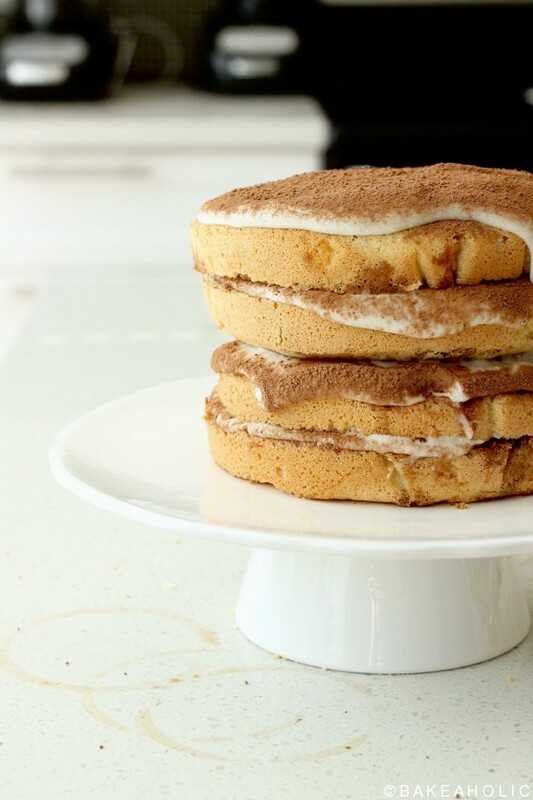 My Nonna had made her delicious tiramisu for my wedding shower at the end of may, and I couldn’t stop thinking about it – i love tiramisu. It’s a great no-bake (or in this cake, baked) summer dessert that is both chilled and caffeinated – the ultimate summer combination. 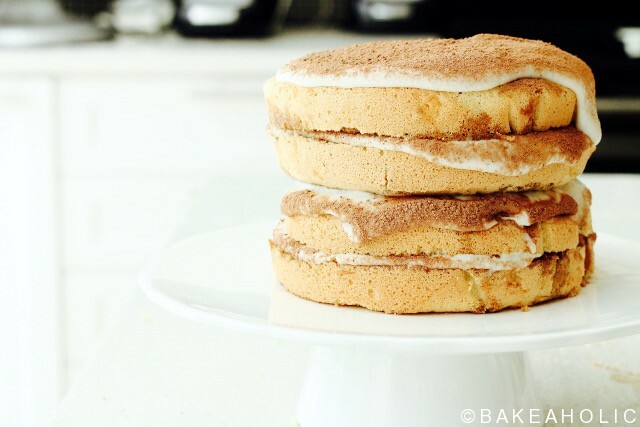 The traditional cake is made with lady fingers, thus no baking required. However I wanted a ‘birthday cake’ feel so i turned the lady fingers into a dry italian sponge cake, then soaked it in espresso and liquor. 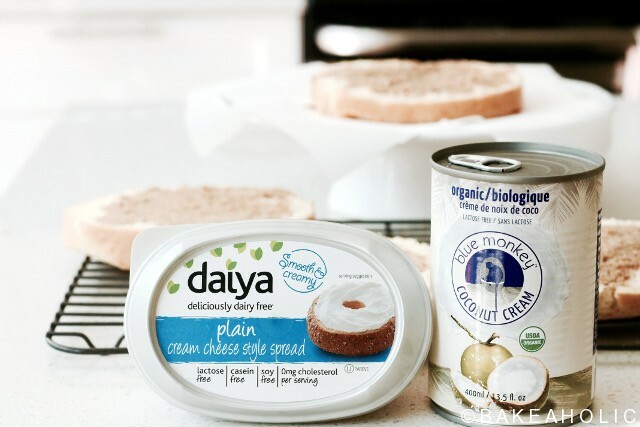 Since I have a dairy intolerance I decided to try out a vegan cream cheese to replace the mascarpone, and added coconut cream to stiffen it up. It turned out perfect – and it was absolutely delicious. I definitely suggest making it for a summer event this year. If you’re like me, and don’t drink coffee but love coffee flavoured foods, you’ll love tiramisu. 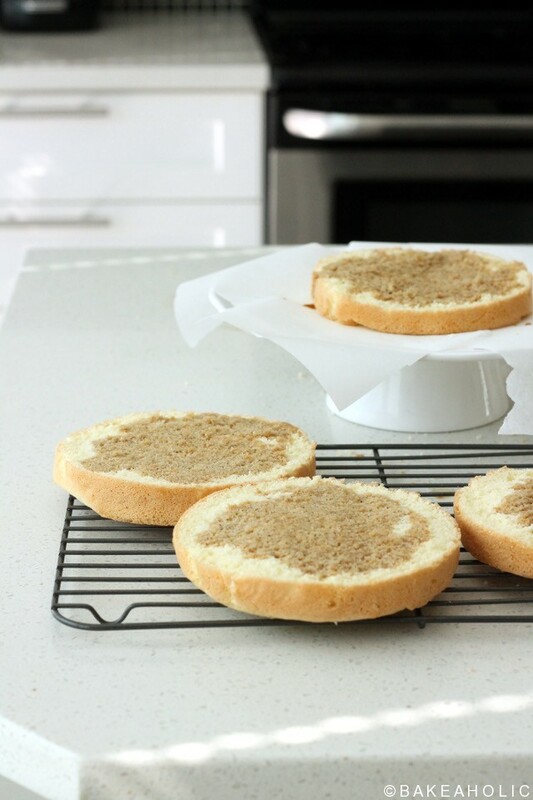 Prepare two 6" round cake pans, line with parchment paper and spray. Separate eggs, putting whites into a large mixing bowl, and yolks in a small mixing bowl. Add ½ cup sugar to whites and beat until very stiff, with handheld blender. Add ½ cup sugar to yolks and beat until very thick and light yellow in color. Next, fold flour in using a spatula, ⅓ cup at at time, incorporating well after each addition. Pour batter into prepared pans and bake in pre-heated oven for 30 minutes, or until toothpick inserted into the middle comes out clean. Cool for 10 minutes then remove from pan and set aside. 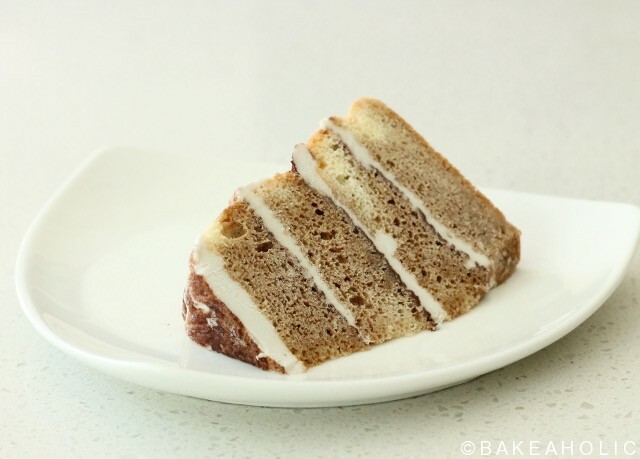 Allow to cool completely, and then cut cake in half. I baked the cake the night before, and let it dry out on the counter overnight before cutting them in half. This allows the liquid to be soaked up nicely, like lady fingers in a regular tiramisu dessert. In a blender with whisk attachment, or using handheld blender, whip the vegan cream cheese and coconut cream until light and fluffy. Add confectioners sugar and vanilla and whip again. Set aside in the fridge. Add the coffee and kahlua together. Lightly soak the sliced cake layers with coffee syrup. Place first layer on cake stand, and add more liquid. 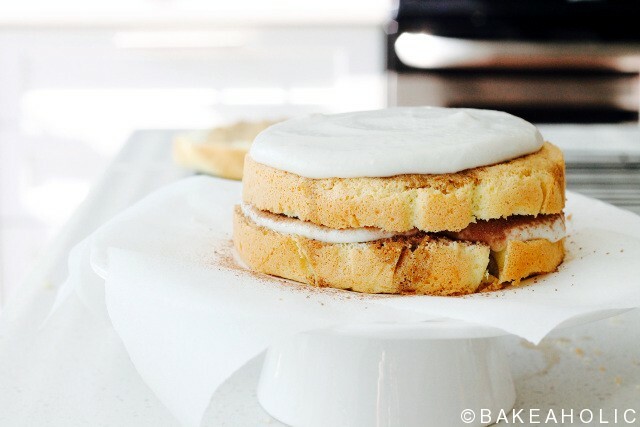 Add 1 cup of frosting to the layer and smooth out with offset spatula. Using a small sifter, add cocoa powder. 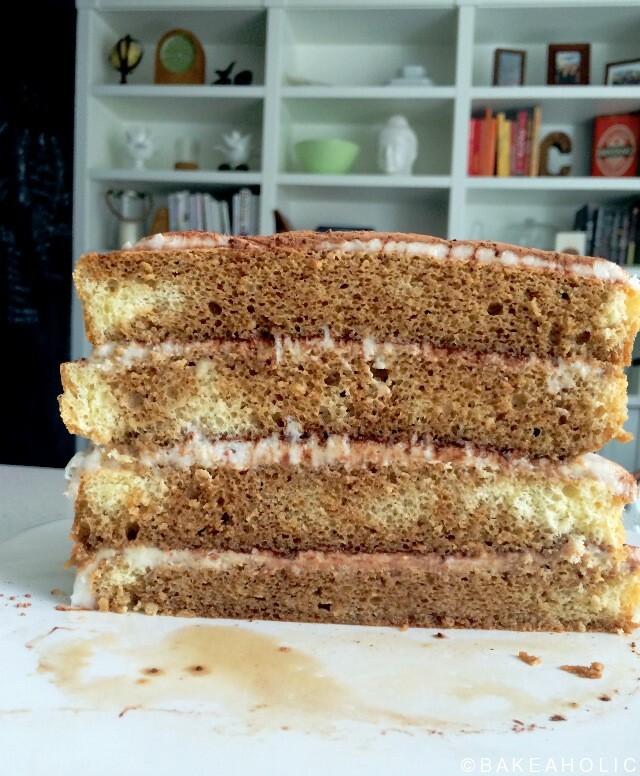 Place second cake layer on top, and repeat process: coffee syrup, frosting, cocoa powder. Continue with all layers, finishing top with cocoa powder or even grated chocolate. You may need to increase coffee syrup depending on how much each layer soaks up. I always make lots and then pour any extra right onto the cake once sliced. Allow to sit in the fridge for at least a few hours, or overnight is better. This allows the coffee to soak into the layers, making them moist, and all the flavours will blend together. Serve cold.